Well we worked a bit on creating a hot liquor tun (HLT) for holding our sparge water in, as our last HLT was much too small. The new one will be able to hold 15 gallons while the old one was a measly 7 or so gallons. 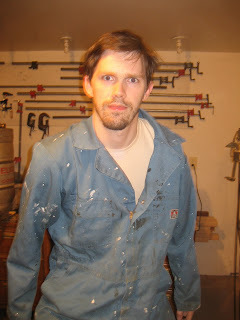 We did this by cutting the top out of on of our extra kegs with a circular saw with a metal-cutting blade. I'm sure your saying to yourself right now.. "man I'd sure love to see Joel sawing the top out of his keg... it would be almost like being there with those crazy Brewthers!" hehe, I love that 4th photo down - because when you squint it looks like a GIANT mug of beer standing next to the brave and steel-happy power-tool weilding brewer. That looks like my saw!